Builders Emporium at Mystic Darkstone Design is dedicated to bringing you builder's edition items for you to use in your own in-world creations. All items for sale in this region are either copy/transfer or mod/copy/transfer. The merchants you will find here are exclusively located at the Builders Emporium. Please take the time to learn each Merchant's TOS since they may vary between Merchants. FULL PERM Builders Edition Mesh Creations (Copy/Mod/Transfer) for the Grid Island Oasis ONLY. No export permissions to other grids. Your end product CANNOT be FULL PERM. Mesh items may not be re-sold as stand alone items. 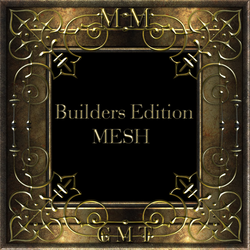 You may use the mesh item as part of your build, again you may not resell the end product using any part of my Mesh as FULL PERM to the next user. You can purchase a Limited Use License* for obtaining dae files for use in content creation in other grids. No re-seller permissions under any conditions (even if you modify it). Modifying my items does not constitute right to resell the item FULL PERM anywhere. READ full TOS in store and in product packaging. Violation of TOS will be seen as theft and will be acted upon accordingly. Submit questions to MM Customer Service.